•Sooner or later you'll want to trash the information inside folders and binders then update the label. At that point you'll really appreciate not having to bother with finding and installing another label or tiny index. With LabelOnce file folder labels you can change your mind six times in the first minute and never ruin the label. 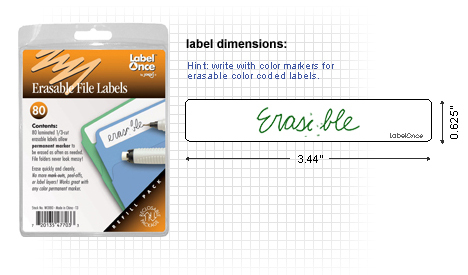 MFG-WCR80 CONTENTS: 80 erasable 3rd cut file folder labels (no marker or eraser) in a non-PVC, transparent, reclosable/reusable clamshell package.